Embattled MSNBC host Joy Reid has finally come clean regarding offensive posts written on her blog more than a decade ago. Tacitly admitted is the fact that Reid herself wrote the posts, which she recently denied in an apology, claiming that her blog had been hacked. 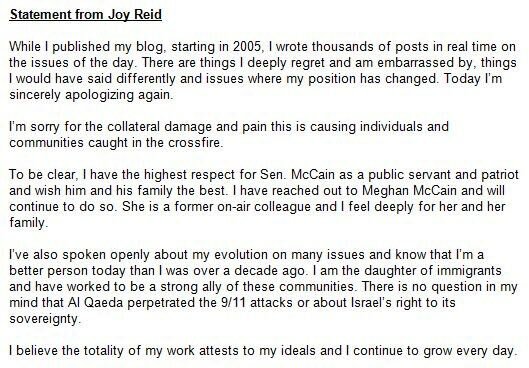 The host of far-left MSNBC’s “AM Joy” is apologizing for the second time in nearly a month after old posts surfaced in which Reid disparaged Sen. John McCain, questioned whether Al-Qaeda was behind the 9/11 attacks, and suggested that Israel should not be a sovereign nation. Therein lies the problem for Reid. It is not just that she has been outed as a bigot, or that MSNBC has not reprimanded her for her disgusting behavior in the slightest, but that she filed a false claim with the FBI, which is a federal crime. Her attorney later claimed that the FBI was investigating the alleged breach. “We have received confirmation the FBI has opened an investigation into potential criminal activities surrounding several online accounts, including personal email and blog accounts belonging to Joy-Ann Reid,” said Reid’s attorney John H. Reichman in a statement on April 25. “I’m sorry for the collateral damage and pain this is causing individuals and communities caught in the crossfire,” Reid’s latest apology says. But Reid is not actually apologetic for her actions, she is only sorry that she was caught. If the rule of law means anything, law enforcement should investigate Reid, and potentially pursue legal action against her. Simple being a media personality does not absolve one of the laws that govern this nation. As for MSNBC’s part, Reid should have been fired after the first incident of indecent blog posts came to light. Any right-of-center personality who behaved in such a manner would have been Roseanne’d – that is fired in less than an hour. But Reid just keeps apologizing and equivocating.